The Costello surname came to Ireland with the Anglo-Norman invasion of the 12th century. They were originally from the Norman family Nangles, or de Angulos, and descended in Ireland from Gilbert de Nangle. Costello and associated variations come from the personal name of a son of Gilbert, Oisdealbhach, whose name consists of the elements “os,” which means “deer or fawn”, and “dealbhadh,” which means “in the form of” or resembling.” The Gaelic form of the surname Costello, which predated the Anglicized version of the name, is Mac Oisdealbhaigh. This is the earliest recorded example of a Norman family assuming a Mac surname. The prefix O has sometimes been erroneously assumed. Church officials and medieval scribes often simply spelled names as they sounded. As a result, a single person’s name may have been recorded a dozen different ways during his lifetime. Spelling variations for the name Costello include: Costello, MacCostello, Costillo, Costallo, Kostello, McCostello, Caustello, Costellow, Costelloe, Jordan, Waldron, Joceylyn and many more. First found in county Mayo where they were granted lands by the Earl of Pembroke in the Anglo-Norman invasion of 1172. View a video on the Costello Heritage. In the mid 10th century two Irish kings, Dermot MacMorrough of Leinster, and Tiernan O”Rourke were feuding over O”Rourke’s wife. O”Rourke, with the help of King Rory O”Connor of Connaught got the upper hand, and MacMorrough fled to England seeking the help of Henry II, King of England. Henry was busy fighting with the King of France over his holdings in Normandy, and referred MacMorrough to his Cambro (Welsh) Norman lords is Wales, particularly Richard DeClaire, Earl of Pembroke, commonly known as “Strongbow”. MacMorrough offered Strongbow his daughter’s hand in marriage plus the successorship to his Kingdom in Leinster. Strongbow saw this as chance to obtain a Kingship in Ireland, out from under the heavy hand of Henry II, plus marriage to MacMorrough’s very beautiful daughter; so he gathered together a group of his fellow Cambro(Welsh)-Norman vessals, and invaded Ireland to help MacMurrough. These Normans invaded Ireland in five waves between 1167 and 1172. Among the Norman knights assisting Strongbow was Gilbert deAngulo, from Angle in Pembrokshire, and his two sons, Jocelyn and Costelo deAngulo. The deAngulos settled in Co. Meath (in Leinster) and established Baronies there after their successful invasion. Costellos are of Cambro (Welsh)-Norman descent from the family of Gilbert deAngulo (later: Gilbert N’angle), who participated in the Norman invasion of Ireland (1167-1172AD) with Richard deClare (Strongbow).Gilbert had 2 sons: Jocelyn and Costilo, later known as MacOisdealbh (Gaelic for Son of Costilo) participated in the Norman invasion of Connaught in 1235, along with the deBurgos (Burkes) and the deLacys. Alluagh Mór, along the river near Ballaghaderreen, was the powerbase of the area and consisted of a three ring fort from which the ruler ruled the whole area. When Gilbert de Angulos crossed the Shannon at Carrick-on-Shannon in or about 1170 and moved South he ousted the O’Gara’s from Alluagh Mór and then build his great castle Castlemór Mac Oisdealbhaig. With this castle as a base, Gilbert conquered the surrounding area until he had conquered and established the Barony of MacOisdealbh (later: MacCostello or The Barony of Costello) in eastern Mayo & western Roscommon, which lasted some 400 years. The Costellos were the first of the great Norman families in Ireland to use the “Mac” (Son of) prefix to their name. Smaller castles were set up as defensive points surrounding this castle and also to control the Barony. Also from here, he inter-married with the local chieftans, the McDermots, the O’Garas, the O’Connors. It was the centre of life of the area and a norman town grew up about the place until the end of the 14th. century. His castle was not for show ………. it was for war. 50 years after it was founded it was sacked by the O’Connors. In 1336 the O’Connors took it again and almost raised it to the ground. Three times it was be-sieged in the 16th Century until finally it was burned at the end of the nine years war and the stones were used to build a linen mill. Along the way the name “de Angulos” became “Costello” through its association with the Barony of Costello and by mis-spelling and mis-pronouncation. After only three generations, they began to give themselves a surname formed in the Irish manner, with the clan taking Jocelyn de Angulo as their eponymous forebear. Jocelyn was rendered Goisdealbh in Irish, and the surname adopted was Mac Goisdealbhaigh, later given the phonetic English equivalent ‘Costello’. The adopted name Mac Oisdealbhaigh eventually became anglicized as Costello. Like many other Cambro-Norman families they became “More Irish than the Irish themselves”. The Barony of MacCostello is still an identifiable geopolitical district in Mayo to this day, and the Costello name is very common in Mayo. The Costellos are described in the “Annals of the Four Masters” as the sons of Oisdealb”. Along with fighting the Costellos were religious and founded their first Abbey at Ballyhaunis, which still exists and is in use to this present day. It was built by Jordah Dubh MacCostello for the Augustinian Friars in 1419. (The name “Jordan” also derived from Costello when some water was carried back from the River Jordan and was used to baptize a new born baby ….. the child was also given the name of Jordan as well as Costello ie. Jordan Costello. Later the name Costello was dropped and thus the name Jordan began. Other surnames such as Jocelyn, Waldron, Nangle decended from the Costello name and were originally Costello). The structure of the Abbey shows that the area was both wealthy and had very skilled craftsmen. On visiting the Abbey you will notice that it is situated on a hill. That hill was originally the site of a Costello or de Angulos Castle dating from the 13th. Century (1245). You can still see the buttress of the castle with some inscriptions outside the Abbey Church. They also founded another Abbey at Urlaur in 1434 halfway between Ballyhaunis and Ballaghadrerreen on the shores of Lough Urlaur. It was a Dominician Abbey. It was founded by the ruler of the Barony of Costello at the request of his wife and was in use until 1846. Buried here is the remains of “Arthur Robert Gorges Costello, last Dynast and Baron De Angulo who died on Jaunary 31st 1891”. A flat headstone marks the grave and is still in excelent condition. (I have copied the text above as it appears on the grave stone and you will notice that the spellings have changed over time). Eventually, the Costello’s lost most of their wealth and power to the Dillon’s. If you ever visit the site of Castle Mór just outside Ballaghaderreen and go to Backaugh Hill (about a mile away) you have a view of well over 30 miles all around. You can see most of Connaught from here ……. the west coast of Mayo, the mountains of Sligo and south Donnegal and on a good day you can see far into the lands of Meath. This is why the location was so important …… whoever controlled this area controled the gateway to Connaught from the East. After the distruction of Castle Mór and the loss of most of the Barony to Dillon, the Costello’s retained just the northern portion of the Barony and moved to Edmondstown House. The family held lands in County Mayo, in the barony of Costello (named for them), in the east of that county, until the end of the sixteenth century. In 1565, their principal seat was in Ballaghadereen. The feuding between the Costellos and their neighbors the MacDermots, gave rise to many a tale, none more moving, perhaps, than the tragic love story of Una MacDermot, daughter of the last chief of that name, and the son of the chieftain MacCostello, Tomás Láidir; …… he fell in love with Una Bán McDermott and she with him, but neither family would allow them to marry, until both of them died of broken hearts and are buried and lie in adjoining graves on Trinity Island in Lough Key which is visable from Lough Key Forest Park. Some say that Tomás Láidir was murdered by the Dillons but I have no real evidence of this. Below is an addendum written by Delia Henry (Charlestown, Co. Mayo). The Costello’s lived in Edmondstown House from the beginning of the 16th century.Tomás Láider and his older brother Dudley lived here. Dudley fought to regain the Barony . He became a well known reparee ( a wild Irish rebel, so called for his being armed with a repaire, or half-pike), Dubhaltach (Dudley) Costello, who, after failing to recover his family estates, devoted his life to wreaking vengeance on the new Cromwellian proprietors. He was finally killed in battle. Arthur Robert Gorges Costello buit a new house in 1864 close to Edmondstown House on the style of a Scottish Manor House. When he built this house he had little money and had to borrow heavily to complete it. As a result he died in poverty on his way to Dublin. The house was bought by the Catholic Church for the Diocese of Achonry from the Costellos and is, today, the residence of the Bishop of Achonry. “Known as Edmondstown House, with seven bedrooms and four bathrooms, it was built in 1864 of stone intersperced with bands of red brick on a split level plan by Captain Arthur Costello, having been designed by John McCurdy, the man who designed the Shelbourne Hotel in Dublin”. The Costello Crest is still carved in stone above the door as you enter. (On my visit there in 1995, Bishop Flynn personally gave a grand tour of the place and spent much time outlining the history of the house and the way it was structurally built). During the “Costello” era, Daniel O’Connell often visited and stayed with the Costello’s at this house. At the rear of the house there is a walkway through the estate which is still known to this day as “The Counseller’s Walk” – named after the great man who used the walk way as a means of both exercise and a way of “getting his thoughts together”. 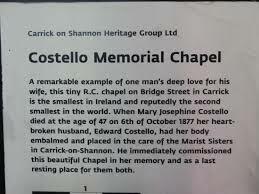 In 1877 the Costello Memorial Chapel in Carrick-on-Shannon was built by Edward Costello to his wife who died aged 46. It was blessed and opened on 1878 and his wife who had been embalmed was buried that day to the left hand side of the door as you go in. Edward, himself, when he died in 1891 was buried on the right hand side of the door. Its the 2nd. smallest chapel in the world at just 12ft by 16ft The 2 coffins are visable underneath a special hardened glass with just the aisle to the altar seperating the two. A noble bearer of this name is John A. Costello who held the post of Taoiseach, or Prime Minister, of Ireland from 1948-1951 and again from 1954-1957 All Costello’s, wherever they may be, owe their roots to the Barony of Costello in the areas surrounding Ballaghaderreen. Its a proud heritage ! Another piece of re-search reviles the following account. The following may be of interest relative to the place where the Romantic Tomas Laidir MacCostello was said to be murdered. One day in 1934 when teaching in Tavneena National School, the Principal, Mr Gerry Henry asked me, Delia Henry, if I knew where “Sithestin” west of Swinford was? Although I lived in Killaturley, Swinford was our postal and Market town and I went to Secondary School there, I had never heard of that place and I said I would find out if it existed. An elderly neighbour of ours, The Lenihans, one Luke Tunney visited in our house. He was about seventy years of age at the time. On his next visit, I put the question to him, was there a village named Sithestin, west of Swinford. After a few moments, he said no, and I quote his own words “There is no Sithestin, but Sithestin Dubhaltaigh” now known as Barcul. It is situated between Shammer Cross roads and the Charlestown/Ballyhaunis road. I had never heard of the word “Dubhaltagh” before, but I cycled through Barcul many times. The next day I repeated the statement made by Luke Tunney. The Principal got a book called “The Love songs of Connaught” by Douglas Hyde and there in the print was “Sisthestin a Dubhaltaigh” “Dudley’s Sithestin”. The poem Una Bhain, composed by Tomas Laidir MacCostello, about his lost love, Una McDermott, was on page 117 and underneath it was an account of the place where he was murdered by the Dillons. The Descendents of The Costellos in the Charlestown area owned some two hundred acres of land at one time, and their Tomb is in Tample graveyard,with the following inscription on it. O Lord have mercy on the soul of Thomas Costello Esq, of Hagfield,who departed this life, February the 1st, 1822, aged 95 years, also his wife, Maria Costello, who departed this life, 6th of January 1810, aged 75 years. His son Thomas Costello Esq, who departed this life, August 1st, 1828, aged 78 years. His son Edward Costello Esq, who departed this life, the 2nd of August 1811,aged 59 years. His son Richard Costello Esq, who departed this life, the 1st of September 1859 aged 95 years, and his grand-daughter Louise Costello, who departed this life, on the 10th of June, 1860, aged 19 years. Erected by Peter Costello Esq. Frances Wynne, nee Costello, wife of Andrew Wynne. Margaret Mulligan, nee Wynne,who was buried on the 16th of February 1987 By her son James,”Seamus” Mulligan. The Descendents of the Costello family named above still live in the Charlestown area. They are: James”Seamus” Mulligan, his nephew Michael Giblin, Nieces Marcella McBrien, Patricia Leonard, Aclare, Evelyn O!Keefe, and Jacqueline Cummins, Swinford. Maire McDonnell-Garvey in her Book, ‘Mid Connacht’, gives a very interesting and detailed account of the Costello Era, and the transition of their lands to the Dillons. In chapter six, the great work done by Charles Strickland – Chairman Of Gallen and Costello relief committee – for the relief of the Poor during the Famine years, deserves the credit given to it. However, though not mentioned in this account, his greatest achievement must be the founding of the town of Charlestown, where the first house was built in 1846, also, the foundation of the Catholic Church was laid in 1856, and the first Mass was celebrated there in 1858. The Church and Town in the Parish of Kilebeagh, in the Barony of Costello, have much to be grateful for the work done by Lord Dillon’s agent,Charles Strickland. The Barony of Costello in part gleaned from The History of County Mayo to the Close of the 16th Century, by Hubert Thomas Knox. The barony is the Lordship of Costello, from whom it takes its name, was first named Ballyhaunis. The part north of the parish of Aghamore was in the kingdom of Luighne or Gailenga and was a subdivision of the latter, called Sliabh Lugha. In St. Patrick’s time the Ciarraige had some of the eastern part about Castlemore and the Letter which they lost by the 13th century. As far back as history goes clearly the southern part was in the possession of the Ciarraige, the successors of the tribes called Cruithnech in the Attacottic list, but they make no great show in history, being one of the tribes on which Brien Orbsen’s ancestors and descendants rested their supremacy in that early period when legends give little more than the names of the chief kings. In the 13th century it was held by two divisions called Ciarraige Utacharach and Ciarraige Iochtarach, the latter known as Ciarraige of Loch na Airneadh, now Lough Mannyn. O’Ceirin was chief of all and had his principal dwelling on or near the lake. Mannin House is close to the site of Mannin Castle which is on a small peninsular. The country about the lake is full of cashels and duns. In the lake were many crannoges. About the lake there are many prehistoric graves and remains of cromlechs, evidence that for many ages the lake has been surrounded by the dwellings of families of high position. In the de Burgo partition, Hugh de Lacy had a grant of Sliabh Lugha. We next find Myles MacOisdealbh established as Lord of Sliagh Lugha. As he is said to have married a daughter of the Earl of Ulster, he probably got it from Hugh de Lacy, the younger. In 1324, Matilda, the widow of Jordan de Angulo, 7th Baron of Navan, and her husband, Nicholas de Kerdyff, sue John and Gilbert de Angulo, her sons, for her dower in the manor of Castlemore in Connaught. John sues certain persons on Angevyston, near Ardbraccan(Meath) and also other places claiming he was a son of Jordan, son of William, son of Hugh, son of Myles(Milo), son of Philip, son of William de Angulo(barons of Navan), who held them in capite in the time of King John. Matilda sought dowers also in Kilbixy and Kildare in Westmeath. This suggests that Jordan was not long dead. John pleaded that his father, Jordan, had not such fee and freehold in Castlemore on the day of his marriage to enable him to endow Matilda. Gilbert’s position in the suit does not appear. It may be inferred that Gilbert or his father had been enfeoffed of this manor. The claim of Matilda was admitted except as to Castlemore, regarding which the result does not appear. The clann of MacJordan, and the smaller one of MacPhilip, were descendants of the de Angulos or Costellos. Castlemore was always the MacCostello chief’s castle. Rathnaguppaun, now called Rath Castle, was the chief castle of the MacJordan Duff. When other castles and land were sold to Theobald Dillon, after the Cromwellian wars, MacJordan kept it and some land about it. The ruins show it to have been a large structure. Almost always at war with each other, these chieftains of the area carried on a more definitive warfare than usual independently of the larger wars of the greater lords. Some random picks; 1365, an attack was made by clann Coisdealbh(Costello) on the Luighne on which occasion six sons of six kings were slain along with Cormac O’ Hara, the Tanist; 1443, O’Flynn and some of his kindred were slain by the clann Costello at the home of O’Killeen; 1545, Walter, son of William MacCostello, went on an expedition to Bunninadden against the sons of Connor Sligo. The O’Connors and some Sweenys defeated him, killing MacCostello and his son, Rudhraighe, atRuscach na Gaithi; 1547, Jordan Boy, son of John, son of Walter Costello, went to Moylurg with 18 followers to seek stolen property. Brien, son of Ruaidhri, son of Tadgh MacDermott, with only 6 men, met him. Brien, badly wounded, his men submitted, but Brien wounded Gilladuff, son of Philip severely. 1549; The Tadgh became MacDermott. He then invited the learned men of Ireland to visit him at Christmas, when he was so generous on St. Stephen’s Day, that he divided among the professors and poets all the plunder he had taken from MacCostello, being 60 cows, and from clann Philip, 120 cows and 10 horses. These were taken in raids of revenge for Brien; 1551, Jordan Boy came again and was defeated by MacDermott in upper Muinchend, losing 20 to 40 men; 1557, Brien MacDermott plundered MacCostello and burnt Tulrohan. A large force overtook him, but he carried off the booty after a fight. Sir. N. Malbie writes to Walsingham, on June 10th 1580, “Costello, pretending to be allied to the Dillons, as he is, hath called him out of the English Pale, this gentleman bearer hereof, Mr. Tibault Dillon, and moving him to join him in friendship(in the name of his kinsman), hath the consent of all the rest of his surname, given of free gift a great portion of his land with a ancient castle called Castlemore. Dillon wishes to devote his life and living to the advancement of good government. Therefore I recommend him.” Dillon belonged to a family having considerable influence in the Irish government, was a man of ability and was not hampered by scruples in the use of his abilities. In a few years he acquired so much that the composition of the barony was made with him alone in 1587. On June 10th 1586, John Costello, captain and chief of his nation, surrendered the manors and lands of the barony with the intention of them being re-granted to him and renounced the title and name of MacCostello and all the Irish customs incident to it by which manors and lands as described below were re-granted to him on 2nd July 1586, to be held in the service of the 20th part of a knights fee and one fair great hawk and 10’s rent as composition for cess out of every quarter that shall be charged therewith by the commissioners. The manors and lands of Castlemore; Kilcolman, Benfadda, Ballindoo, Letter MacPhilip, Twoee Balliallon, alias Slyeve, O’Loee(Sliabh Lugha), Mannyn, Illanmacgillavally, Bealagary, Annagh, Castlea, Bellaveel, Tuirohaun, Beken, Keryeghter, Keryoghter, Cowgy, Ballindingen, and three towns of Errick. Letter MacPhilip is part of Kilbeagh towards Doo(Black) Castle or Ballindoo and Sliabh Lugha comprises parts of the Boehagh and Mullaghanoe ranges. Bealaragy or Balanagar is now called Cashlaun na Drancaddha near Ballyhaunis, Keryeghter, Keryoghter, and Cowgy or Coogue, now parts of Aghamore and Knock, the present townlands of Coogue lying to the northwest of Lough Mannyn. Ballindingen is probably the town of the fort called Dhine Daingean in Kilgarriff townland, south of the Coogues. MacCostello’s title being thus secured, he seems to have sold it to Dillon immediately, the transaction being thus noted in the Annals of Lock Ce 1586, “The great castle of MacCoisdealbh and half the lordship of the country were given to Tibbot Dillon by MacCoisdealbh, i.e. John, son of the Gilladuff, son of Hurbert. O’Gadhra gave five towns in his division and the castle of Daire-Mor to the same man.” Dillon acquired most of MacJordan rights also, as we find him in the 17th century owning all the castles of the country except for the MacJordan Castle at Rathnaguppaun. When the composition was made, the survey of 1587 dealt with the country in five divisions, viz; Castlemore 52 qrs; Letter MacPhilip 48 qrs; Keryoughter 52 qrs; Tulrohaun 52 qrs; Ballyhaunis 48 qrs;. For the assessment of composition rent it was recommended that four of these quarters be treated as one quarter of 120 acres owing to the poverty of the country. Thus the MacCostellos lost their place among the great landowning families of Ireland. Dillon’s transactions must have been generally fair though Sir. R. Bingham took exception to the ways he and others had got large tracts of land. The MacCostellos did not take advantage of disturbances to turn against him. The change may have benefitted them in various ways. They were not all turned out of their castles and lands, the alternative, but held on English tenures paying a fixed rent, free from the irregular exactions of chieftains and quarrels and jealousy due to uncertain successions. Under him as landlord they received all benefits which the composition was intended to confer on the subjects of the old chieftains. The new ideas of English government would be brought into effect only too soon. 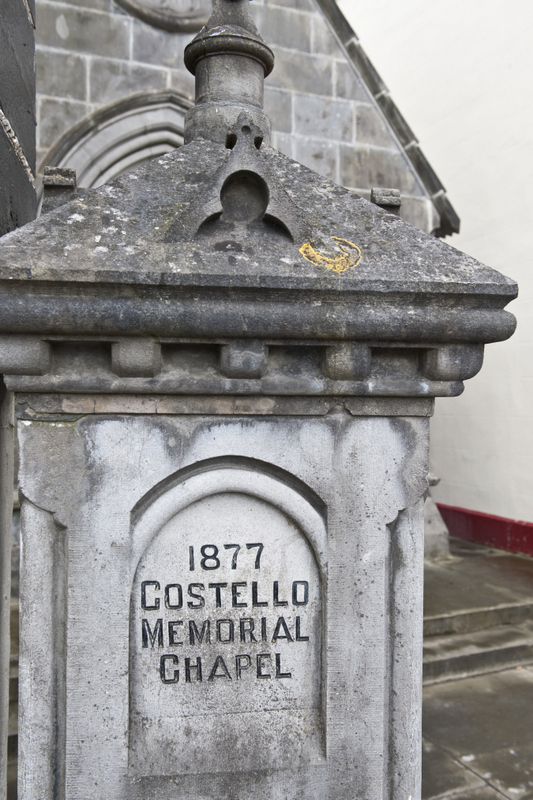 The Costello Chapel in Carrick-on-Shannon. This tiny but exquisite memorial was designed and built in Carrick-on-Shannon as a burial place for Mary Josephine Costello, who died on October 6, 1877. She was 47 years old when she died. Her husband, Edward Costello, was a local trader. 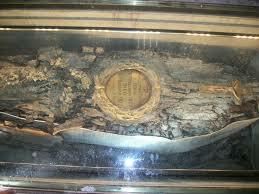 He had her body embalmed and placed with a nearby nunnery for safekeeping while the chapel was being built. Completed in April of 1879, the dedication ceremony included a Requiem Mass for Mary. 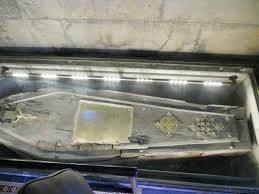 Her beautifully adorned casket was placed in a sunken area to the left of the entrance door, where it was covered with a specially made glass. Until 1897, Mass was said on every first Friday of the month in the chapel. 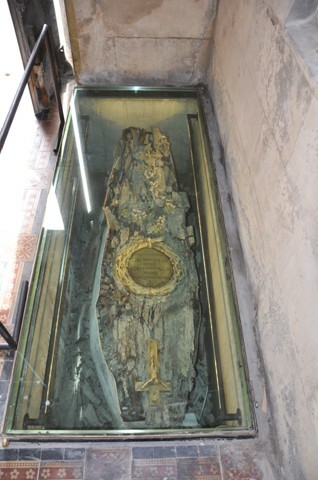 When Edward died in March of that year, he was laid to rest on the right side of the chapel. The couple had no other family members. Costello Chapel, the smallest in Ireland and the second smallest in the entire world, is 16 feet long and 12 feet wide. Nestled among more modern buildings in the town of Carrick-on-Shannon, its entrance is marked by two stone pillars topped by beautifully designed Celtic crosses. The Costello coat of arms is visible at the top of the gable, its Latin words translate to-“Seek not thyself outside thyself.” The entrance door is fashioned from decorative wrought iron. Inside, the entire building is made from bath stone- there is no woodwork. 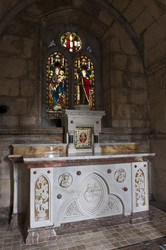 The beautifully decorated marble altar sits in front of the single stained glass window. 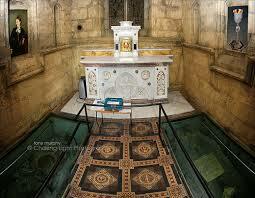 Between the two glass-covered burial sites stand panels of tiles showing scenes from the life of Jesus. When the dedication ceremony was planned in 1879, a special chalice was commissioned and used for the First Friday masses. It was passed on to St. Mary’s Roman Catholic Church following Edward Costello’s death. If you supply more info we can pull your relatives names off the 1900 census . Did not see any COSTELLO from Ballybeg around the turn of century. “Bangor Erris” is the next village /town close by, none COSTELLO surname in that area. Edward and Josephine Costello, were my great grand uncle and aunt. My father Eamonn(Edward), grew up in Carrick on Shannon, in the 30’s and 40’s. We have some research done, but I must do, more! Do you know if there has been any DNA gathering done? I would like to establish a proximity if any to the Main Line! Do you know if there is a Chief of the Name for the Costellos? Brilliant read I’m very interested in the Cadiz Spain nugget from 1540 to today. I live in San Roque Cadiz any information much appreciated. Yep fantastic stuff from the Cavan Costello branch. Thank you Gerry for the amazing job you have done on the Costello family. My family hail from Ballybeg in the Barony of Costello near Ballyhaunis Co. Mayo, I wonder if you would know when the tenants on the Costello land actually became owners of the land and how did that come about. I have the will of my great grandmother from 1906 who willed the land to her son my grandfather so it would obviously have to be before that year. Any information you may have in this regard would be greatly appreciated. Gerry, thank you so much for creating this website. We just recently returned from our first, of many I hope, trip to Ireland. I am not sure where my people actually came from, but your history of the origins of our name, and the film you produced was very heart warming. On our next trip I hope to visit some of the sites you mentioned. Once again, so many thanks and warm regards. thank you so much for your visit to our site and for taking the time to post a comment. Hopefully you might visit Skehana and if I can help in your visiting the sites mentioned I will be too glad to assist you. Hello! I just want to offer you a huge congratulations for the great information you have shared with this post. Thank you for your work and efforts. Greetings from Florida! I found your site during lunch break. The information you present here on the Costelloe Name is fantastic and can’t wait to take another look when I get back home. I’m amazed by your research. May I contact you in the future ? Anna, thank you for taking the time to read my contribution. Feel free to contact me at anytime. Great job assembling all the various COSTELLO histories etc, and excellent info you wrote up as well! My relatives are down in Leitrim More, another Gerry Costello and his brother/ local contractor Vince and two other brothers John and Des who live in NYC. My dad is Sean Snr the oldest of the family of Robert Michael Costello, who married Kathleen Whelan from Kylebrack West. Tommy Whelan the flutist from Ballynakill Ceili Band is my great Grandfather , James Costello my Cos great Grandfather. I have researched our clan for years as well, and the latest nugget I am looking for concerns how we ended up in the Ballinasloe area. I know we were mercenaries for Crovderg OConnor, from the annals circa 1205 – 1212, but how did we end up staying and surviving in the Moenmagh area for all this time. Any info or direction would be appreciated. I may have a nugget for you, we have a huge presence in Cadiz, Spain from the 1540’s until today ! Great job Gerry, my Dad is 84 now and loved all the info. upon this site for him. So let me say Thank YOU for spending the time to talk about this subject here on your web page. Some fascinating material appears on this site. Keep up the good work. Hey very nice web site and particularly a really great account of the Costello Heritage !! .. Excellent .. Superb ..
My grandmother on mums side, Ellen Mary Costelloe came over here from Peterswell, Co. Galway. She met my grandfather in Hammersmith in 1948 and our part of the family chain began. At first I thought I was reading about Skehana in Peterswell but now I know I was wrong and must visit your Skehana next time we make it over. you will be more than welcome anytime. Just let me know when and we will arrange to meet up. This website was shown to me through my cousin. I am just so thrilled to read this post written about the family name. Nobody else in our family circle has or knows such detail about our roots. Thank you for your information. Every bit of information adds to the family insight. Amazing website! Do you have any helpful hints for aspiring writers? I’m planning to start my own website soon but I’m a little lost on everything. Would you advise starting with a free platform or go for a paid option? There are so many options out there that I’m completely confused ..
a formidable job and the whole community will be grateful to you. Keep it up! All the best.